Born in Dehradun, India, Ashwani Gupta graduated from Jawaharlal Nehru Engineering College, India, and obtained a diploma from INSEAD Business School in France. He started his career in 1992 in engineering and purchasing in the private sector and later moved to management positions with Honda India and Japan in 1996. He joined Renault in 2006 as general manager of purchasing at Renault India in Mumbai. In 2008, he moved to the Renault Nissan Purchasing Organization in France as global supplier account manager for braking systems. He joined Renault Nissan B.V. in 2009 as deputy general manager, global purchasing. 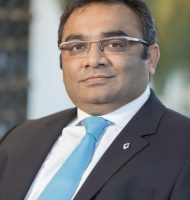 In 2011, Gupta was appointed global program director for Datsun vehicles at Nissan Motor Co., Ltd. in Japan, where he led the product development to launch in India, Russia, Indonesia and South Africa. He has been vice president of Renault’s Light Commercial Vehicle Division since 2014, where he oversees the automaker’s worldwide LCV business. On April 1st, 2017, Ashwani Gupta was named Alliance Senior Vice President of the Renault-Nissan LCV Business, and then Alliance Senior Vice President of Renault-Nissan-Mitsubishi LCV Business since April 1st, 2018. He is a member of the Renault Management Committee.